Date & Time : 19th May 2015 (Tuesday) 8:00 p.m. The Macao Cheong Hong Orchestra invites again the Youth Chinese Orchestra of Macao Residents’ School to hold a joint concert titled “The First Debut on the Stage” concert. The songs for the concert include: Chinese Percussion “Fishermen’s Triumphant Song”, Liuqin Solo “Fishermen Song”, Guzheng Unison “Dance of the Minority Yao”, flute Solo “Spring on the Xiang River”, orchestra “Dance of the Minority Ah Mei” and “Spring of the Tian Mountain”. 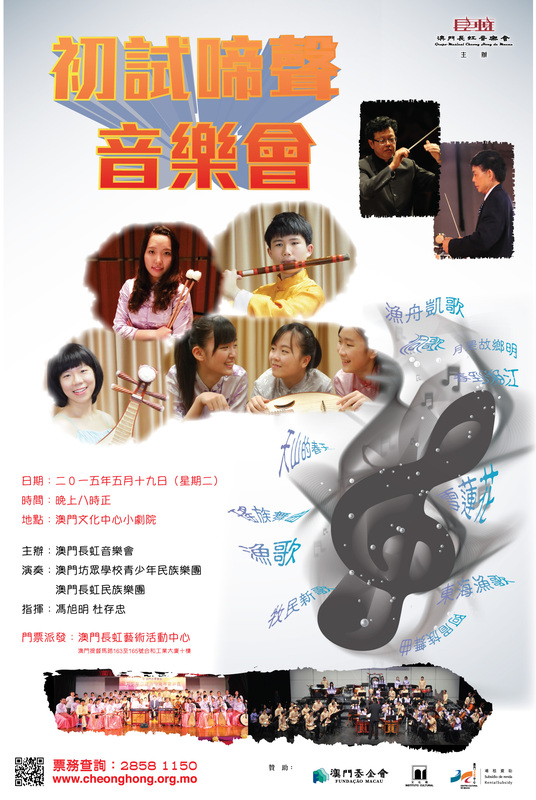 The Youth Chinese Orchestra of Macao Residents’ School was founded in 2010. It aims at arousing youngsters’ interest in traditional Chinese music culture by educating them the basics of conventional music. Over the years, the school has organized a variety of folk music instrument courses. With the help and support of Macao Education and Youth Affairs Bureau, Macao Cultural Affairs Bureau, Macao Conservatory, Macao Chinese Orchestra and Macao Cheong Hong Music Club, and under the leadership of its Artistic Director and Principal Conductor Fong Iok Meng, the Orchestra has become a well-organized music group among all music groups in local schools. A former music teaching researcher of the Guangzhou Education Bureau, member of Chinese Musicians Association, China Nationalities Orchestra Society and China Chorus Association. He had been working for a long time in researching and guiding the school music teaching, and he had also been invited as artistic director, consultant or conductor, coaching numerous Chinese orchestra and chorus of many Children's Palace and schools, making a significant contribution to arts education. He had been praised and noted with good deed by the provincial and municipal Government for several times and was selected as a outstanding teacher in Guangzhou City. He gained the Musicians Award of Guangdong Province, Outstanding Art Activities for Children Award of Guangdong Province, etc.. In 2010, he founded the “Youth Chinese Orchestra of the Macao Residents' School” and acted as artistic Director and Principal Conductor. He had made a certain contribution in the promotion of traditional Chinese music between teenagers of Macao and training traditional Chinese music talents. Shenzhen for performances in spare time, making performances in the primary and middle school, tourist spots in Macao and being well acclaimed. Kuan Mei Yin, is studying in the fourth yeaar of Beijing Central Conservatory of Music, major in Chinese percussion. Now she is under the tutelage of the Percussion Teaching and Reaching Department Director in Central Conservatory of Music, Wang Jianhua, vice president of China Society of percussion teacher. She had learned to play flute since 11 years old. Later, she stared to learn Chinese percussion while studying in secondary school with teacher Zhuang Jiepai, principal percussionist of Macao Chinese Orchestra. She has participated in many concert of Macao Chinese Orchestra and others Chinese orchestra. In 2007, she won the Gold Award of the first Youth Art Festival between China, Taiwan, Hong Kong and Macao. In May 2013 she participated in the performance of Chinese percussion concert, and other concert presented by the Chinese Orchestra of the Central Conservatory playing the masterpieces of Wang Shimin in June. She graduated from Xinghai Conservatory of Music, majoring in arts management, minor lute, Guzheng. She had learned Pipa with Wong Kin Wai, Mei I Xin and Deng Le, teachers of Macao Conservatory. During the study she has been awarded by Xinghai Conservatory of Music as "Three Good Student", and then gained the scholarships for Hong Kong, Macao, Taiwan and overseas Chinese student issued by the Ministry of National Education. She got the second runner-up of ensemble group in the 19th Macau Youth Music Competition, the runner-up of others Solo (Liuqin, Pipa, flute) and the second runner-up of Trio awards in the thirtieth Macao Young Musicians. In 2011 she joined the Macau Cheong Hong Music Club and had followed the delegation to Hubei, Hainan Island, Burma for performances and exchanges. Borned in Macau, they are studying at Form IV of the Macao Residents' School and are members of the “Youth Chinese Orchestra of the Macao Residents' School”. They started to learn Zhongruan in the interesting class with teacher Leong Man Vai and Leong Oi Kan, since childhood. In 2011 they joined the Macau Cheong Hong Music Club and learned more Zhongruan skills with Tou Chun Chon. They participated in many large and small concert and followed the Orchestra to visit Wuhan, Xiamen, Jingzhou and other places for cultural performances and exchanges. In 2013, they gained the Good Performance Award of ensemble group of Traditional Chinese Music in the Macao Youth Music Competition. In addition, LokYu Dan was admitted to the Academy of Macao in 2011, then she started to learn Liuqin with the Liuqin chief, Wei Qing, of Macao Chinese Orchestra. Copyright (C) 2010 | Macao Cheong Hong Music Club.